"Amazing what unlimited styling versatility this iron has"
"Stunningly beautiful straight hair or flamboyant flicks or curls with one versatile iron"
Increased maximum temperature up to 410° F.
Instant heat recovery by IC temperature control system. Contemporary ergonomic design for the ease of operation. Round edge of ceramic heating panel for easy finishing touch. Ceramic heating emanate far-infrared rays and negative ions. Super fast heat-up process and even distribution of heat across the plates. 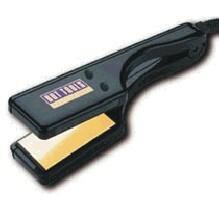 Far-infrared heat seals in hair's moisture, natural oil, hair color and protects cuticles of hair. Excellent for all hair types from color treated, damaged, fragile to thick & coarse hair. 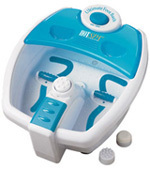 Creates smooth polished hair with natural static-free shine, luscious curls, twirls and flicks in minutes. 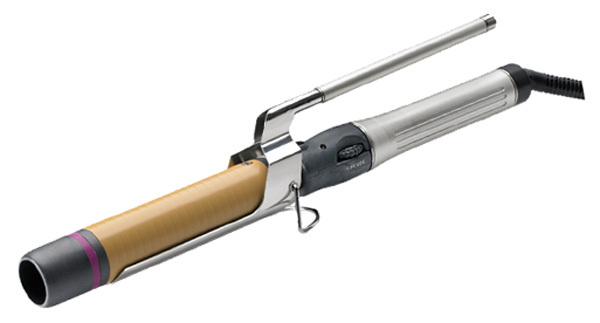 Our Most Popular Curling Iron, this Item features a handle and clamp that turns 360 degrees. Features adjustable temperatures of up to 410F. Comes in six different sizes: 1/2", 3/4", 4/5", 1", 1 1/4", 1 1/2"
Real ceramic stone heater generates far-infrared rays and negative ions to provide shiny and silky hair. Barrel is made out of true ceramic coated with tourmaline. Top stylist's number one choice. Once hair is clamped, both the handle and clamp turns 360 degrees allowing for quick curling of hair. Made for professional salon use or for experienced home users only. Home users may find it inconvenient with the freely swinging clamp. Stylists may use this feature to their advantage. Known for its durability, stylists find this item dependable and long-lasting. This product comes with a one year manufacturer's warranty. 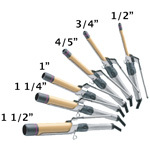 Comes in nine different sizes: 1/4", 1/3", 2/5", 1/2", 4/7", 5/8", 3/4", 4/5", 7/8. Our Smartest Curling Iron...features new mechanism of turning barrel with fingertips!! Ideal for users with wrist problems or carpal tunnel syndrome. Made for professional salon use only. Uncovered barrel tips allow stylists to easily maneuver and curl extra hair ends around the barrel. Real ceramic stone heater generates far-infrared rays which provides shiny and silky hair. 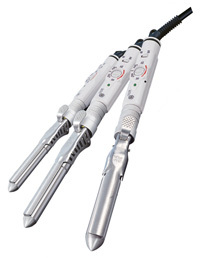 Bio-ceramic heating element and anodized barrels provide balance heat for superior protection to the hair. 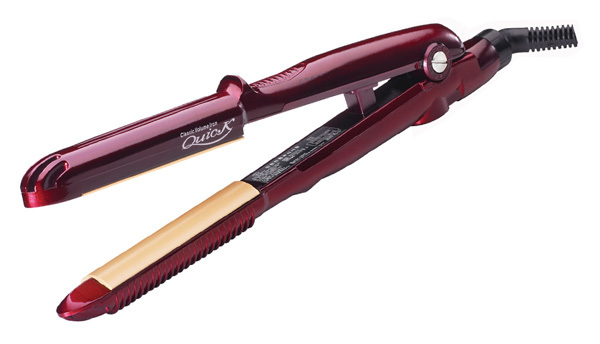 Creates smooth, extra shiny and frizz-free curls by the action of far-infrared heat and negative ions. Quality handles made of heat-resistant material. Product meets Create's product quality tests and is known for its durability. This product features a one-year manufacturer's warranty. 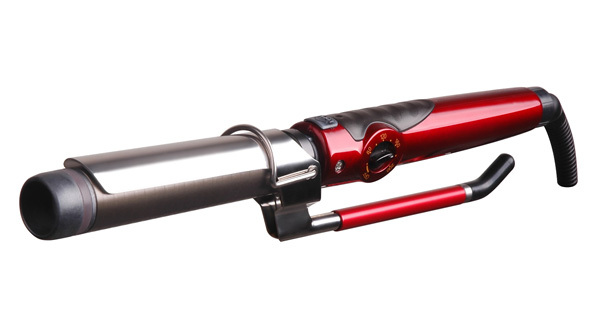 Our newest "2 in 1"Curling Iron, this Item features a handle and clamp that turns 360 degrees. Comes in three different sizes: 4/5", 1", 1 1/4"
Barrel is made of Tourmaline and Ceramic anodizing technology to protect the hair against heat damage.